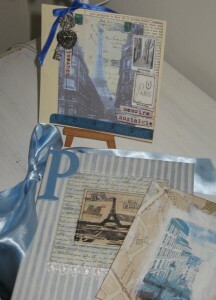 A sneak peek into one of my altered book projects with a Paris theme. Images courtesy of Altered Pages & word strips from Sultane a French paper company. Pop back later in the week when I will be adding more images. Tattered Angels Seaglass and Denim glimmer mist. Jackie has a special deal going for friends who follow my link to her space and sign up for the newsletter you get one free digital sheet collage to get you started. For my friends that like a little on line cropping and scrapping action, a special invitation to join in a cyber crop over at Scrapping Outback. Starts Friday July 15 and runs through the week. They lured me in with the cutest range of chipboard titles and shapes but found them all to be so friendly it has become a favourite place to hang out. Lots of prizes and goodies donated from my other favourites Tattered Angels and Australian Scrapbook Ideas Magazine. Looking for a little inspiration to get you started? Click into the latest Wendy & Heidi how to video in all shades of glimmering colour. and I think you all know why……..if not click and see for yourself. These pages are lovely Mandy. Looking forward to seeing the rest as you post them. Looks to be the makings of a beautiful book and the soft French blue is so perfect! These pages are stunning, Mandy!<br />Great design. wonderful glimpse you give us… i love blue! Can&#39;t wait to see this book as it comes together! The shade of blue is so serene. Beautiful work. The pages are very beautiful and great artwork. Very nice, Mandy. The pages are gorgeous. Very French and delicate and so artistic…love altered books – looks like this one will be very special. These are very beautiful…look forward to seeing more of your pieces! Gorgeous Parisian style there Mandy. They are stunning. Oh, now I want to go run and CREATE!